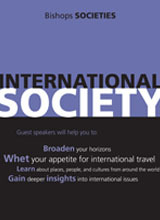 The way the International society works is that guest speakers are invited to address the members on any topic of ‘international’ interest. We have two meetings during non-exam terms and one meeting in exams terms. Anyone is free to join the society – members are expected to attend all meetings. The guest speakers are asked to speak for 45 minutes. A few minutes are allowed for questions and then we break for refreshments. Boys can stay on and chat to the guest speaker informally over a cool drink. In 2012 we had the following guest speakers: Professor John Rogers - "Time travel in the Middle East"
Richard Wells (parent)- "A season in Tanzania"
William Esau (OD) - "The Lion King London"
International Affairs meetings take place on Thursday nights from 20:00 – 21:00, twice in non-exam terms and once in exam terms. All meetings are advertised in the Pink Notice.